Monsoon Dangers to My Roof. Did you know that Monsoon season starts in the middle of June and ends in September? But, did you know with the continuing threat of rain and wind can affect Phoenix roofer’s ability to re-roof or repair your roof. Our monsoon season can also be dangerous to your roof. The word Haboob comes from the Arabic word, “Strong wind”. When I was stationed in Saudi Arabia during the First Gulf War Haboobs were common, coming back home to Phoenix, many times the larger Haboobs remind me of my tour of duty in Saudi Arabia. Haboobs form after a good Phoenix Monsoon storm. Rain cooled air from the monsoon plunges to the desert surface at speeds of up 100 miles per hour. These strong winds kick up our desert dry and loose sand, causing the Haboob or large dust storms. These strong winds can affect your Phoenix roof. It can blow of shingles, loosely installed tiles and even affect your air conditioners. These sudden and strong winds can cause your shingles or roof tiles to lift up or even blow off. It allows debris to move quickly and clog scuppers or roof drains on flat roofs. Trees and their branches can easily damage your roof. The monsoon season have the potential to cause serious damage to your roof. If you own a commercial or residential flat roof our heavy monsoon rains can cause serious issues. Our roofs get over whelmed with the sudden and large mount of water. If your in-roof drains or scuppers are blocked by debris this large amount foo water may be impeded by the debris. This puts stress on your roofing structure and not only cause serious leaks but also can cause roof collapses. 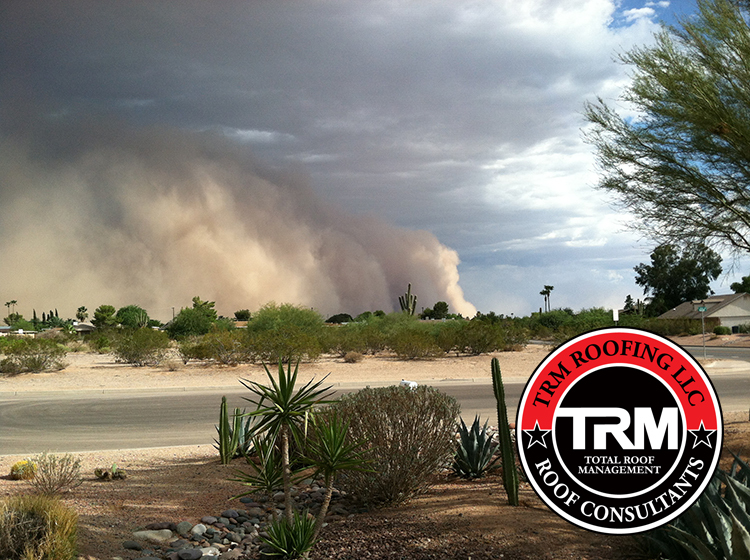 It is always wise to have your roof inspected before monsoon season and especially after a storm. Being proactive is always “Roof-Smart”. Contacting a certified NRCIA (National Roof Certification and Inspection Association) roof inspector can put your “contractorphobia” at ease. For more information about roofing or roof inspection visit www.CostEffectiveroofing.com. First, let’s get the insurance question out of the way: Will my homeowner’s insurance cover my roof leak? Since Arizona is not subject to annual hail or storms like Texas, Oklahoma or Kansas, most Arizona property owners have little knowledge of what is covered by their insurance. Many are under the impression that their insurance will cover roof repair or roof replacement. Obviously, insurance policies differ between insurance companies, types of coverage, and individual states’ laws. Every homeowner should understand what their Insurance actually covers. Homeowner’s Insurance covers roof damage not neglect. There are two basic coverage’s on your policy that you should be aware of in your homeowner’s policy. Actual Cash Value (ACV) is computed by subtracting depreciation, which is based on age and condition of your roof– from the roof replacement cost. estimated cost of $4,500 for your new roof less your deductible. company would pay, at the present time, to replace your roof. In the example above, the roof replacement cost is $10,000. The insurance company would pay out the value of the roof in today’s market of $10,000, less your deductible. Most likely, you have Replacement Cost Value type coverage; which entitles you to have your roof replaced with like kind and quality when it is of equal or better condition then it was before the damage occurred. Posted on May 31, 2017 Categories Phoenix Roof Repair, Phoenix Roofing Contractors, Replacing a roof, Roof inspections, Scottsdale Roofing ContractorsTags commercial roof repair, phoenix roof repair, residential roof repair, roofing contractors2 Comments on Will my Homeowners Insurance Cover a Roof Leak? TILE, SHINGLE, FLAT, FOAM it doesn’t matter most Phoenix roofers will tell you, “It’s time to remove the old roof and install a new one” One of the biggest fears is really knowing if your roof can be repaired or if you have to replace it. There will come a time when you have to decide what to do about your roof, it may be looking a little deteriorated and may have some leaks. Most individuals dread this decision and put it off a much as they can, “out of sight, out of mind”, sometimes until they have no other choice and they have roof failure. At this point most property owners are fearful of calling a roofing contractor. By that time costly damages may have occurred and roof replacement is the only option. A timely roof repair or even a maintenance program would have protected the building. The extent of the roofing problems and the age of the roof are major factors that can help you decide on what course of action to take. Can I repair my roof? The last thing you want to hear when it’s raining is “You Need A New Roof”! Lets face it; most people don’t want to spend capital expenses on a new roof, especially if you can get more years out of your existing one. Getting a roofing contractor to show up is difficult enough, let alone getting three bids on a new roof, then choosing the right contractor. Wouldn’t it be better to really know what the condition of your roof is and what your options are? Learn to be ROOF SMART: When it comes to real estate, roof issues are usually ignored, until they leak. If you are having roofing issues, problems, leaks, etc. After calling your favorite roofing contractor call a roofing contractor that specializes in roof inspections and knows how to provide a written roof report with OPTIONS…. Know what is going on, know your options about your roof prior to taking the word of a hungry roofer or slick roofing sales guy. Posted on May 24, 2017 Categories Phoenix Roof Inspections, Phoenix roof maintenance program, Phoenix Roof Repair, Phoenix Roofing ContractorsTags Balcony repair Phoenix, Flat roof repair phoneix, phoenix roof repair, roof repair2 Comments on Roof Repair or Roof Replacement??? 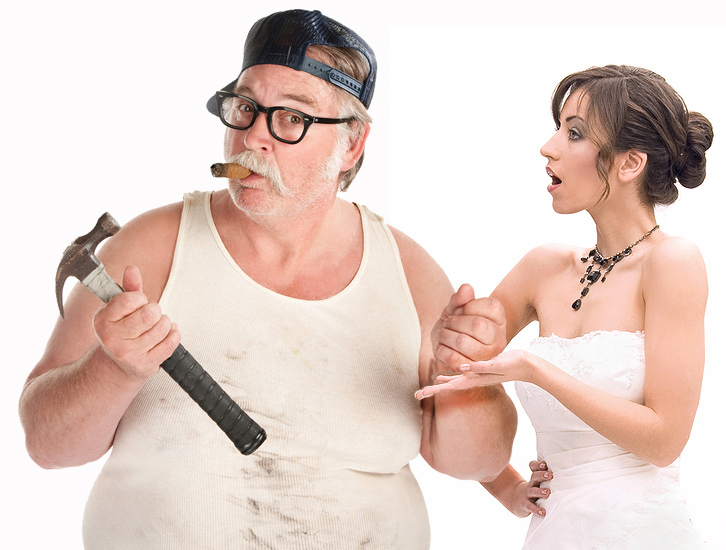 Did You Know Hiring a Roofer is Like Getting Married? Did you know hiring a roofer is like getting married? Think about it! Did you know that number one reason for divorce in America is getting married too fast? Many couples get married too fast and too soon, not realizing what they’re getting themselves into. The second biggest reason for divorce in America is communication breakdown. It is almost the same when hiring a Phoenix roofing contractor. Most property owners focus on price first, like many focus on looks. Hiring a roofing contractor too fast can lead to a disaster, much like a marriage. Using the “marriage” analogy, there’s the dating sage, honeymoon stage, reality stage and the mature marriage stage. Dating Stage: Interviewing several contractors is like dating. There is always small talk, trying to get to know one another. Then you get a bit more serious once scope of work and money are discussed. Honeymoon stage: You settle on a price, start date, etc. You like everything your chosen roofing contractor is going to do. You’re so excited to get your roof repaired or new roof and all seems fine. Reality stage: The roofing project work has started. It a bit messier then you figured, little more noise, maybe is taking a bit longer then you or your roofer anticipated. There are some ups and downs, hidden things that neither party knew about, but you keep moving forward to completion of your roofing project. Mature Marriage Stage: The roof project is completed, but the relationship doesn’t stop there. Now comes the workmanship warranty period. You are actually married to your roofing contractor for the life of your roof warranty period. If something goes wrong what type of partner are you going to have? One that is hard to communicate with, one that does not take responsibility, one that always has to be right, one that is just not there one you need them, or one that once the fun is over you can’t find them. Moral of the story: Interview your roofer as if you will be married to them for 5 or 10 years. Don’t jump in too fast, even if they come highly recommended. For more information about choosing a contractor there is a free downloadable book just click here. Posted on February 13, 2017 November 2, 2017 Categories Phoenix Roof Repair, Phoenix Roof Restoration, Phoenix Roofing ContractorsTags Balcony repair Phoenix, Flat roof repair phoneix, phoenix roof repairLeave a comment on Did You Know Hiring a Roofer is Like Getting Married? 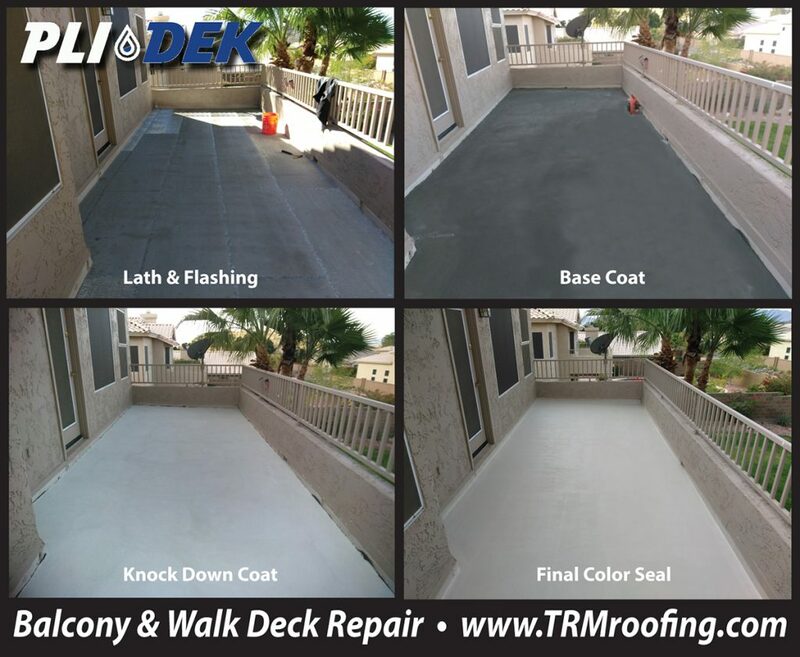 DIY Foam Roofing Repair & Maintenance Phoenix: If you have a foam flat roof in the Valley of the Sun you can understand the advantages of a sprayed polyurethane foam roof. One of the biggest factors that many property owners don’t think about is proper Phoenix foam roofing repair and maintenance. As a property owner with a foam roof you have two choices; hire a professional Phoenix roofing contractor or DIY… Do It Yourself Foam Roof Repair and Maintenance. Foam roofs can sometime develop blisters, which are usually caused by trapped moisture; most of these foam blisters do not cause an immediate threat. If left unfixed these foam blisters will eventually split exposing the foam roof to UV degradation… SUN LIGHT. This will cause your foam roof to deteriorate. Cut out the blister and remove any burnt or wet foam within the foam blister, you want to get down to dry and white foam. It is important to make sure everything is dry. Using a sharp utility knife cut the edge of the roof foam at a 45-degree angle away form the blister. This will provide a smooth tie-in with your caulking. There are several manufactures’ of elastomeric caulking, I recommend APOC’s 264 Flash N’ Seal Roof and Flashing Sealant. With a trowel, fill the foam blister void with APOC’s 264. Make sure to push the caulking in and completely fill the foam blister void. Smooth out to match your current foam roofs texture as much as possible and allow the APOC 264 Flash N’ Seal Roof and Flashing Sealant to cure for several days. When the repair is cured or dried, coat the top of the foam roof repair with an elastomeric coating to ensure no future damage will occur. I recommend APOC’s 252 Sunwhite Premium Elastomeric Roof Coating. There are lower priced elastomeric roof coatings you can purchase at Home Depot or Lowes. For more information about foam roof repair and maintenance visit: www.costeffectiveroofing.com. Foam Roof Repair in Phoenix, many homeowners and commercial property owners cringe when people mention foam roofing or SPF, (Sprayed Polyurethane Foam). The fact is Phoenix foam roofing is very easy to maintain and may be the last roof you will ever need to install on your home or business. Foam roofing in Phoenix is easier to repair than other roofing systems. While most flat roofing systems like a TPO single ply roofing or modified bitumen roofing have to be removed after their useable lives, foam roofing with proper roof maintenance and foam recoating can last indefinitely! If you want a Phoenix foam roof repair you can do it yourself or hire a Phoenix Roofing contractor to repair your foam roof. Many Phoenix DIY property owners choose to maintain and coat their foam roofs themselves. Many choose to hire a Phoenix roofing contractor to repair and coat their foam roofs. Hiring a profession licensed Phoenix roofing contractor provides several advantages. First, most have the experience to properly repair and coat a foam roof. Second, they provide a roof warranty and finally hiring a professional roofer provides you the peace of mind that if something goes wrong or you have a leak, you can just contact the Phoenix roofing contractor that repaired and coated your foam roof. As I have stated so many times, “In Arizona we put a roof on and forget about it”. Unfortunately, this type of thinking is very expensive! Foam roofs are renewable which means your Phoenix Foam Roof can last a lifetime. All it takes in annual roof inspections and roof maintenance. Here’s a foolproof tip on roof repair Phoenix. One of the biggest roofing challenges is to really know if repairing your roof is the best option in the long run or to know when it is time to throw in the towel and re-roof your house. There will come a time when you have to decide what to do about your roof, it may be looking a little deteriorated and may have some roof leaks. Most property owners dread this decision and put it off a much as they can, “out of sight, out of mind”. People are hesitant to call out a Phoenix roof for a roof repair, concerned that they will get taken advantage of. It’s not uncommon for property owners to change out tiles in their office or paint over a leak stain on their homes’ ceiling. Ignoring a roof leak wont make it go away. A timely roof repair Phoenix or even a roof maintenance program would have protected the roof on their building or home. The extent of the roofing problems and the age of the roof are major factors that can help you decide on what course of action to take. One of the first and most important actions to take is to have a roof inspection. You want a roof inspection, NOT A ROOF ESTIMATE, tell your Phoenix Roofer you want an actual roof inspection, with pictures and options, cost of repair verses the cost of replacement. The last thing you want to hear when it’s raining is “You Need A New Roof”! Lets face it; most people don’t want to spend capital expenses on a new roof… Especially if you can get some more years out of your existing one. Getting a Phoenix roofing contractor to show up is difficult enough, let alone getting three bids on a re-roof, then choosing the right Phoenix roofing contractor. Wouldn’t it be better to really know what the condition of your roof is and what your options are? A thorough roof inspection and with a written roof report should address all critical areas of the roof, provide recommendations for repairs, a maintenance program and/or roof replacement. This Phoenix Roof Inspection Report should include pictures of roof areas that require attention and a proposal for the above Roof Repair Phoenix recommendations. A good roofing contractor should have a certified roof inspector on their roofing staff. Understandably, some Phoenix roofing contractors will charge an inspection fee if you choose to go with someone else. Many property owners with older flat roofs don’t realize they have choices when it comes to re-roofing. When a Phoenix roofing contractor see an older flat roof that leaks they immediately want to tear it off and put on a new roof. Phoenix Roofers will provide a myriad of re-roofing options. Besides proposing to remove your old flat roof and replace with torch applied modified bitumen or a TPO single ply roof system, they can also propose to “overlay” your flat roof with the systems I just described. Depending on your flat roof, whether an older built up roof or asphalt built up roof your Phoenix roofer can use a slip sheet or a fan fold type insulation board and install the new roof system over the old roof system. Let’s talk Phoenix Roof Restoration and “TRUMP” like tax breaks! Most phoenix roofers don’t even think of proposing a phoenix roof restoration system. Whether you have an asphalt and gravel built up roof, a standard built up roof or a modified bitumen roof system a Phoenix roof restoration system may be for you. Both APOC Roof Coatings and Polyglass Roof Coatings have up to 15-year manufacturer warranties available to Phoenix flat roof owners who used authorized Phoenix roofing contractors. The “TRUMP” like tax breaks with Phoenix Roof Restorations and Phoenix Roof Maintenance! In general, roof replacement is amortized over 39-years where a Phoenix roof restoration system is considered roof maintenance and deductible the year the work was performed. Ask you personal accountant or tax attorney regarding your particular tax situation. Many older flat roofs in the Phoenix metro area have multiple layers making a roof overlay system not an option. Most local Phoenix building codes and the international building codes don’t allow a roof with two layers to overlaid with and third roof system. This is where the Phoenix Roof Restoration System is a viable option. Next time you have an older and leaky Phoenix flat roof ask your contractor about the Phoenix Roof Restoration system option. 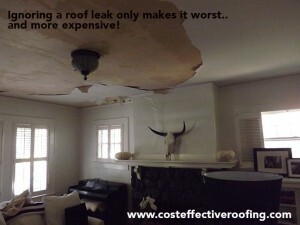 For more information visit www.costeffectiveroofing.com. Hiring the Lowest Bidder Could Cost You More! Last week I was starving, I normally do not eat fast food but, what can I say, I was starving! I found a local Phoenix fast food restaurant; I will keep the name private. While I was food “sinning” and eating my Supe r Taco, I noticed water stains on the ceiling; apparently they had some roof leaks. When I finished my lunch I found the manager about her roof leaks. “We just had our Phoenix roof repaired right before the monsoon’s hit”, she explained. She went on, her Phoenix roof was still leaking and the Phoenix Roofing Contractor came back and fixed the problem. Well, it hasn’t rained for a while so she figured here Phoenix roof repair was good and her roof was watertight. 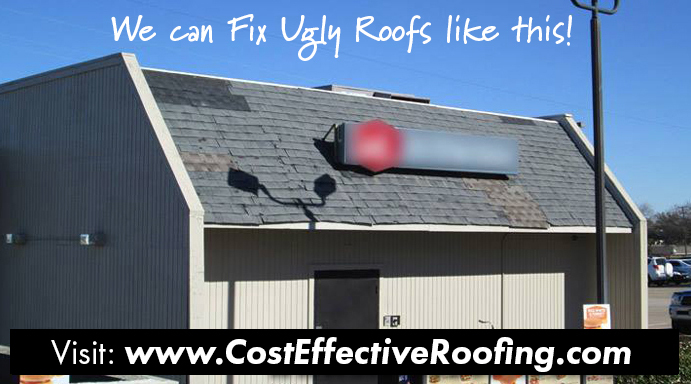 Hiring the lowest bidder for your Phoenix Roof Repair can cost you more! I went outside and took this pic of the Phoenix roof repair with my IPhone!! This roof couldn’t have bee repaired by a licensed Phoenix roofing contractor, or could it? I wont go into detail what is wrong with this Phoenix shingle roof repair; a picture is worth a thousand words. This is why hiring the “Lowest Bidder” could cost you more! No matter what type of project you have, roofing, insulation, etc., hiring the lowest bidders is actually more expensive, a lot more expensive. When choosing a Phoenix roofer or a Phoenix roof repair you have to choose wisely. Asks lots of questions about the roofing estimators personal experience and about the company. Now the Phoenix Roofing contractor company doesn’t have to be in business since Arizona became a state, but check them out. Check out their website and do your research. Posted on October 29, 2016 February 3, 2017 Categories Certified Roof Inspections, Flat Roof Repair Phoenix, Mesa Roofers, Phoenix Roof Inspections, Phoenix Roof Repair, Phoenix Roofing Contractors, Roof inspections, Scottsdale Roofing ContractorsTags Flat roof repair phoneix, phoenix roof repairLeave a comment on Hiring the Lowest Bidder Could Cost You More!